On June 28, 1834, Congress reduced the size and weight of gold coinage to take the profit out of exportation and meltdowns. The Classic Head Quarter Eagle type was released later in the year. This long overdue reform reduced the amount of gold in each coin by about 6.3%, and helped retain gold coinage in circulation. 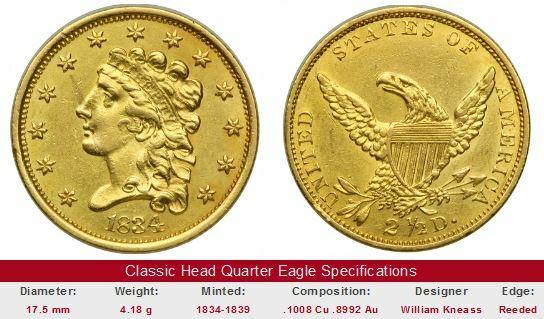 The Classic Head Quarter Eagle was minted in much larger quantities than its predecessors. From 1834-1836, production was ten times greater than the cumulative mintage of the quarter eagle types of 1796-1834. Mint Engraver William Kneass depicted Miss Liberty with a somewhat masculine face, looking left, with a full head of curly, flowing hair. She wears a headband inscribed with the word LIBERTY. The reverse borrowed heavily from former Engraver John Reich’s eagle design, first seen in 1807. The main difference was the omission of the motto E PLURIBUS UNUM (Latin for “Out of Many, One”). Because the new Classic Head design resembled older quarter eagles, the absence of the motto gave the public a sure way to confirm the lighter-weight issue. In 1834, Cyrus McCormick patented a machine to harvest grain. The McCormick reaper required only 2 people for operation but could do the work of at least a dozen laborers. Use of the reaper spread quickly, as farmers could order the disassembled machine through the mail. McCormick's invention helped raise grain production dramatically throughout the US. 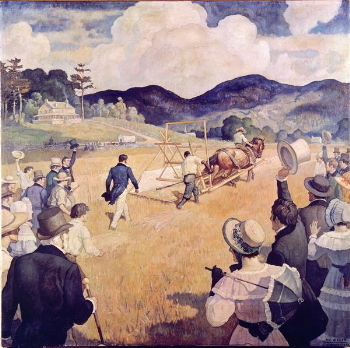 The above painting depicts the 22-year-old McCormick demonstrating his machine to the public for the first time. Improved mining techniques in the 1820’s brought abundant quantities of North Carolina gold to the surface. In 1828, gold was discovered in northeast Georgia, touching off another boon for the mining industry. The Classic Head weight reduction of 1834 gave gold coinage a better chance of remaining in circulation, providing further incentive to mining interests. The next logical step was to convert raw southern gold into spending money. The biggest obstacle was the distance to the Philadelphia Mint, the only government coining facility in the United States. On March 3, 1835, Congress acted to remedy this problem by authorizing the creation of branch mints at Charlotte, NC and Dahlonega, GA, both within easy proximity of the gold fields. In addition, a mint was established at the old city of New Orleans, LA, a crucial economic hub at the mouth of the Mississippi River. 1839 was the final year for the Classic Head Quarter Eagle. The Coronet type, also called the Liberty Head, was adopted in 1840 to coincide with the design of larger gold coins already in circulation. It is advisable to buy key date Classic Head Quarter Eagles that have been certified by one of the four leading grading service companies: PCGS, NGC, ICG, or ANACS. If not, then the seller must be someone of unquestioned reputation. Rip off artists understand how collectors salivate at the mere mention of Charlotte and Dahlonega coinage, and utilize this emotional attachment to unload overgraded, or heaven forbid, fake coins to trusting buyers. The links below take you to eBay US coin auctions featuring key date Classic Head Quarter Eagles. The left hand side of each "Sales Box" depicts value trends over a very long period of time for the specified key date in F-12 condition. The percent annual increase since 1950 is computed for comparative purposes. The right side of the box is a link to eBay US coin auctions that isolates "for sale" offerings of the coin. Key date Classic Head Quarter Eagles are truly rare, so bear in mind it is possible that even on eBay, there is no certainty an example is on the auction block at any given point in time. The coin pictured for sale in the right hand side, if any, is not necessarily the same condition coin as that represented in the value trend analysis on left hand side.